The seventh sign of zodiac is Libra which is based on the element of air. Being social beings, all they care about is balance. Their strict aim is live their life in harmony. The Libra man knows what he wants and how to get it done. Like other zodiac men they are also charming but are not manipulative. They like to maintain the balance in every aspect of their life, like in relationships, social conduct and job sectors. 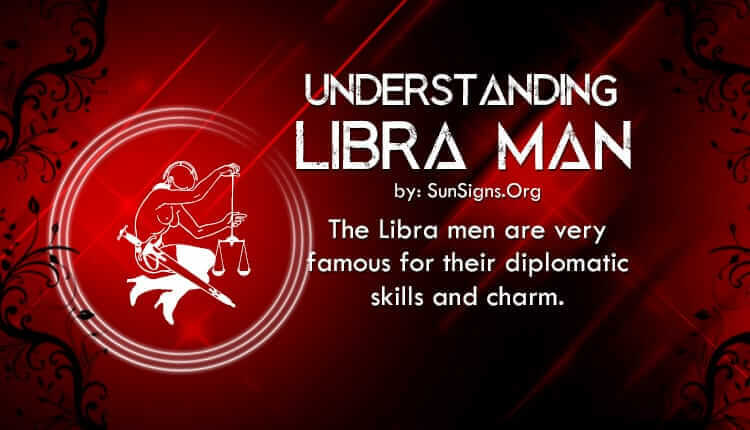 The Libra men are very famous for their diplomatic skills. If the Libra males are given a task, they can not go to the depth of it. They just take a quick short overview and then want to do it very quickly. This happens in their working environment and in their personal life too. The very good side of a Libra guy is that they never do anything without thinking about the consequences. Before acting, they will think about all the pros and cons. They are selective in case of food and dressing. They usually love good clothes and good food. In job sectors the Libran is a good guy if given proper guidance. He will not do anything on his own, but if he can be motivated in the right way then he will finish it accordingly. In relationship, Libra zodiac sign men are one step ahead. They can not be easily dumped because they can see their partner’s mind. It is said that there is always a connection of mind between a Libra man and his partner. A Libra man can thus find his true love and love her truly. There is always a natural mask which hides the real Libra man from other people. This mask may make them sometimes seem like a bad boy to their partner. But in reality he wants to be true in his love, and he has got a very kind and loving heart for his partner. Sometimes there may be some misunderstanding between them but this is also due to their laziness in doing things. But in real life Libra males are not very patient. They are very superficial people. They usually can not stick to their views. They are easily infiltrated by the views of other people. But to get what they want, they can go to extremes. Unlike most other men they are very easily biased and quite often they change their mind. The Libra men are charming but lazy. They do not get the position they deserve due to their laziness. Another bad side of Librans is that they never want to make any decision. This is probably due to their lazy nature also. The Libra men never like to quarrel. They always want to live in harmony and peace. They also possess an attitude of justice. They do not like those who are trouble makers. They always want peace both in family and in the society. When they see some disturbance in the society, then with their diplomatic skill they try to solve it. They are very good people to live with because they will easily like your ideology and follow them as such. They may not prevail because of their constantly changing mind. If you are a Libra man reading this article then you should be more active in your practical life. Otherwise you will lose things which you deserve. Previous What Is Astral Plane & Travel? Next What Are Your Karmic Lessons? I found little truth here, and most of it sounds brutally dishonest. Whomever wrote this is 100% clueless, or a hater. Ouch. Was this written by a woman that got frustrated by a libra man? As a libra myself, I have to say most of this is true. Are we lazy or do we understand the true meaning of enjoying the moment more than most? Our heads are in the clouds with hope and optimism while trying to balance reality but failing. We want to control everything but dont want any troubles. I think the problem is we are so emotional, sensitive, and fragile that we do the least amount of hard change of any sign. We understand how hard a rewarding life is and we are fine settling for good enough as long as we can avoid the mess. The problem is life is messy an we just dont want to play. All the signs are playing a game muddy and we are fine on the sideline with an expensive drink and a beautiful view. Am i right?? What? Your description sounds nothing whatsoever like me. Libra men are fragile, sensitive and emotional? Wow! Maybe you are but not I. Lazy? I do more than just about anyone else. Lazy…maybe you’re lazy, but I’m not, so don’t group all libra men with you.